Drug addiction is on the rise in many parts of the world. In the United States alone, a 2017 national survey found that 19.7 million people over 12 years old had a substance use disorder. This included misuse of alcohol and illicit drugs, such as marijuana, prescription drugs and heroin. This meant that about 1 in 13 people in the US needed substance use treatment in 2017, but only about 19 percent of those received any treatment. Many struggling with addiction are hesitant to seek treatment. They may be afraid they won’t be able to stay clean. Or if a person is addicted to a prescription drug, they may be concerned about finding alternate treatment for their medical condition. But, a recent survey by Recovery.org showed that addictions recovery is very possible, and there are certain things you can do to support your success. The reasons behind drug addiction are unique for each person. And finding a recovery strategy that works for you needs to be just as unique. Your doctor can help you create a recovery treatment plan tailored to your personal needs. They will be able to recommend local counselors, support groups and personal strategies that can help, as well as possible medications or other medical interventions. In Recovery.org’s survey, 988 people in recovery shared what has helped them the most on their journey, as well as some important things to keep in mind. Let’s take a closer look at the survey results and what you can do to support your own recovery. 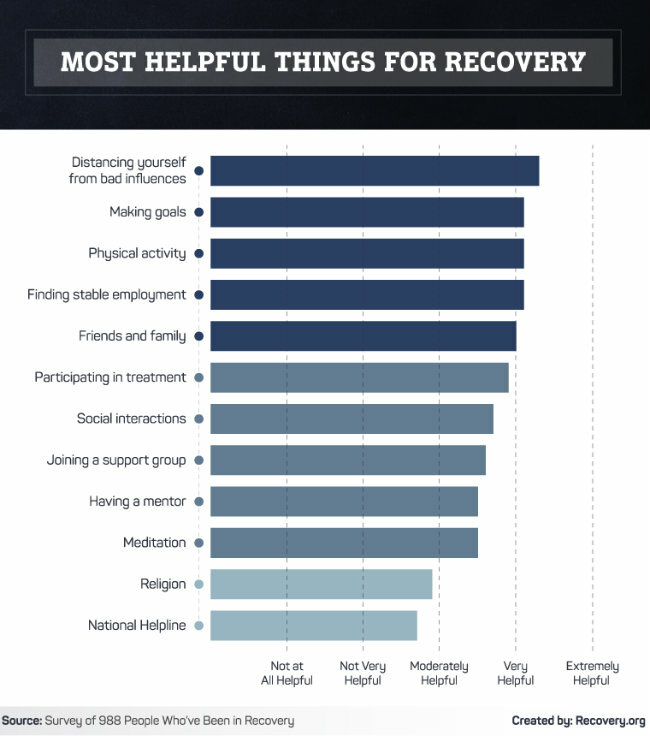 This was at the top of the list for Recovery.org’s respondents. Addiction is typically caused by a complex mix of psychological, environmental and biological factors. And it’s shown that cues in a person’s daily routine or environment can become psychologically linked with drug use. Re-encountering these cues can trigger strong cravings, even a decade or more after someone last used drugs. That’s why removing as many of these environmental cues from your life as possible can really help reduce cravings and relapses. Consider moving to a new place, a sober living home or other drug-free living environment. If your previous social circle revolved around drug use, do your best to build some new social connections. Try joining a club, taking a class, volunteering or attending events in your community. Find people who will support you during recovery, rather than dragging you into old habits. Research shows that you’re 42 percent more likely to achieve a goal when you write it down. So, take the time to consider what you really want to achieve with recovery and write it down. You may also find it helpful to consider how you want your life to look like in one, five or twenty years from now. Creative visualization is another technique shown to help achieve your short-term and long-term goals. Keep in mind that achieving your goals may not be a straight line. You may have relapses and set-backs along the way. But be patient with yourself and don’t get discouraged. Recovery.org’s survey found that recovery becomes easier over time. The longer a person was in recovery, they had relapses less frequently, and relapses lasted for shorter times. Also, they found it easier to resist relapsing after being in recovery for at least 3 years. Most drugs affect the brain’s reward and pleasure centers, which creates feelings of euphoria and floods the brain with dopamine. As a person continues to take drugs, the brain typically adapts by reducing the ability of its cells to respond to the drug. This can create a vicious cycle of taking greater amounts of drugs to achieve the same effect a person experienced the first time they took a drug. Physical activity naturally boosts your dopamine levels and the good feelings that come with it. It can also help break the cycle of cravings for a drug. Any form of exercise will promote the release of dopamine. Try getting in the habit of walking daily, swimming, jogging or participating in any other activity you enjoy. It’s very useful to have a steady income, but work can be about much more than money. If you have a job you enjoy and work with people you like, you’ll naturally feel happier and have something to look forward to each day. Having a job also means you’re contributing to society, which can help create a sense of purpose in your life. Research has shown that having a sense of purpose in life is an important part of health and wellness. It has multiple health benefits, including helping with addiction recovery, combating depression, protecting against cardiovascular disease and even promoting a longer life. Don’t be afraid to reach out to those who are closest to you. It’s probably been very painful for your friends and family to see you struggling with addiction, so they would likely be more than happy to help support you on your road to recovery. It may be a bit out of your comfort zone to ask for help, but you can take small steps at first. Maybe ask a sibling if they want to go out for coffee and simply chat. Or ask a sober friend to go for a walk together. These small connections can help start a conversation about recovery, and you may be surprised how much those around you really care and would like to help. Once you’ve created a recovery treatment plan with your doctor that you’re comfortable with, don’t let it sit on a shelf. Throw your heart into it and follow the steps you’ve laid out toward recovery. A treatment plan can help guide the way, but in the end it’s up to you to take action and help yourself. This relates to distancing yourself from bad influences, but social connections are also an important part of overall mental and physical wellbeing. Social contact that’s related to your recovery can be very helpful, such as joining a support group or finding an addiction recovery mentor. But social connections that have nothing to do with addictions can be just as beneficial. Try joining hobby or activity groups in your local community, volunteering for a cause you find meaningful, talking to your neighbors, or getting involved at your place of worship. Meditation has a wide variety of health benefits, and it’s another great way to boost dopamine and other feel-good chemicals in your brain. Meditation has also been proven to help with addiction recovery. One of Recovery.org’s survey respondents stated that, “Success is feeling a power over the substance, not the other way around.” Cultivating greater self-awareness through meditation can support this feeling. Recovery.org’s survey shows us that addiction recovery is possible for everyone, especially when you’re armed with the right information, a good support system and a personalized approach that works for you.